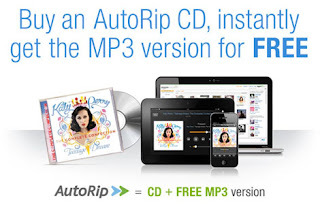 Amazon is today introducing a new service called Amazon AutoRip, which automatically gives customers free MP3 versions of any CDs they’ve purchased from Amazon since the launch of its Music Store back in 1998. Customers will also have access to a growing number of new releases. The digital music is being placed in users’ Amazon Cloud Player accounts. At launch, the AutoRip service is offered for over 50,000 albums on Amazon.com, with more on the way, including both back catalog and most new releases. Free MP3 Downloads › Free MP3 Songs - Do you like free music? Would you like me to post some free music each day?